The report gave NEA got a big wakeup call about what “meaningful arts participation” means in a digital age. 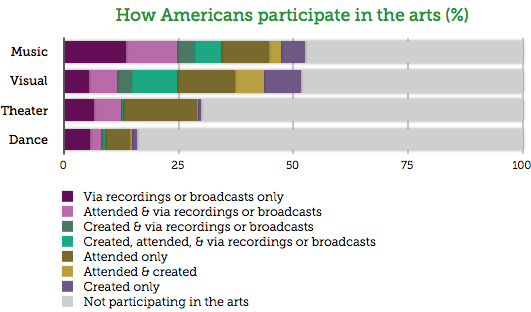 For nearly 3 decades, the largest survey of American’s involvement in the arts defined involvement using old-school activities, such as live attendance at jazz or classical music concerts, opera, plays, ballet, or visits to art museums or galleries. Based on those criteria, the original 2008 report showed “that art is working for fewer Americans, a finding that is deeply disturbing to all of us who care about the arts in our country. It reports a 5 percentage point decline in arts participation by Americans,” said chairman of NEA, Rocco Landesman, in the preface of a new report. But as I have been traveling across this country, those findings did not ring true with what I was seeing: young people signing on to Pandora and plugged into all manner of mp3 players; people of all ages watching Dancing with the Stars and So You Think You Can Dance; the prevalence of etsy.com and the quarter of a million military families who visited one of our 920 Blue Star Museums over 4 months this summer; the Kindles and Nooks in front of every airport passenger; Netflix and YouTube allowing all manner of film and media, past and present, to be consumed anywhere. And how about Glee? I am witness to a voracious American appetite for the arts that does not seem to track with a decline in arts participation. So was there a discrepancy? Yes. The authors of the original report overlooked the digital world, and last week’s report tries to remedy that. Survey questions like, “Did you go to the opera?” are straightforward and arty; but how do you characterize digital consumption? The 2008 study did not differentiate between listening to a single music track, and being a dedicated fan. Does taking a photo with a camera phone count as creating content? It’s a lot easier to take digital photos than toting around a film camera was. Pew Internet recently reported that 33% of internet users have paid for digital music online. 16% have paid for videos, movies, or TV shows. 10% have paid for e-books. Looking at what people are doing with their phones, ComScore recently reported that 52% take photos, and 16% listen to music. As the proportion of smartphones increases, we can expect those number to rise. At what point does taking photos cross over into being art? Does listening to pop music mean people are engaged in arts? 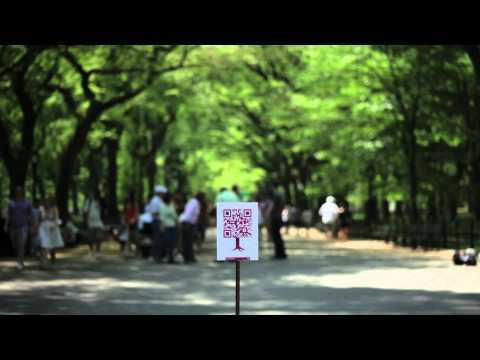 More interesting is how people can create their own content. New art made with new digital tools (for phones & tablets) that make it easy to create music and visual images. For example, photo and art-related apps for digital phones and tablets allow photos to be manipulated, and for fingertips to create digital brushstrokes. More amazing are the new digital music tools, such as those announced by Apple yesterday for the iPad2, in Garage Band. This $5 app has more power than expensive synthesizers of old, includes many touch-controlled virtual instruments, and also “smart instruments” which allow the user to choose chords, without the learning curve for a real guitar. Strumming a finger on the screen makes beautiful guitar chords. Apple’s CEO Steve Jobs enthused yesterday that teenagers will create tons of music with this. The Survey of Public Participation in the Arts is the nation’s largest and most representative periodic study of adult participation in arts events and activities. It is conducted by the NEA in partnership with the U.S. Census Bureau (the SPPA questions are asked by census officials when interviewing a small subset of households). Five times since 1982, the survey has asked U.S. adults 18 and older about their patterns of arts participation over a 12-month period. Hopefully the next survey will look closer at the digital space; and perhaps this will also affect legislative and institutional priorities about how NEA works to improve American’s literacy in the arts. Here’s a short press release about the report, and the report PDF.